Deadline extended! Entries are now due 3/26 at 4:00 pm. This project’s focus is creating banner art for downtown light pole banners in the City of Osseo. The finished banners are 17.5 x 37.5 inches and hang vertically. The banners are changed seasonally. The “Summer” banners are displayed from late spring to fall, and the “Winter” banners are displayed from fall until spring. Selected artwork will be professionally printed digitally on a high-quality vinyl. This vinyl product comprises the banners. The designs should accommodate variability in the banner manufacturing process and may require modifications. The City will contract with a vendor to print the banners at the City’s expense. City staff will install the banners. We are seeking designs that the public will perceive in a positive manner. We encourage artists to consider images that play with Osseo’s unique, historic downtown context. Images may include original text and poetry, or the artist may obtain the rights to use text or poetry from another source. No advertising, branding, or commercial images allowed. Works containing controversial images that are offensive in nature will not be accepted. Artists may submit up to four (4) designs. JPG or PDF formats are preferred for submissions. Once selected, the artist must submit the final, high-quality image to the City. Selected artists are responsible for all costs related to providing the image in a quality format (see below) that can be resized and manipulated by the selected vendor for individual boxes. These artists’ costs may include, but are not limited to, photography, scanning, and graphic design expenses. Fonts must be converted to outlines. If fonts are not converted to outlines, please provide Macintosh or TruType fonts. Artists will be involved with City staff and vendors in the approval of a semi-final layout of their image on banner. If images of real living people are included, the artist must obtain a release from these people for the images to be used in this way. The artist must also obtain all releases necessary for text or poetry. Selected artists shall sign the cover sheet for this scope of services that includes the Intellectual Property terms outlined in Section 10. All questions regarding this RFP must be submitted in writing to the above address/e-mail. A. Cover Sheet: Completed copy of the attached cover sheet, signed by the artist. B. Digital Image Submissions: Up to four (4) designs per artist. Image guidelines: Each image must be a separate file, labeled with the applicant(s) name and a number. Do not include explanatory text in the image file. Printed photographs, brochures, slides, or web sites should not be submitted and will not be reviewed by the selection panel. Submitted image size: Images should be in a rectangular format, with a ratio of 1 wide to 2.14 tall. If your image is not rectangular, please mask your image to bring it to the appropriate size. JPG or PDF files are preferred. If works contain a text, a signed statement stating that: 1) You, the artist, own the copyright, or 2) the text is in the public domain, or 3) that you have contacted the copyright holder and they have given you a written agreement that you have permission to use the text; the written agreement must be provided along with the submission. Signed release forms and contact information must be included if works contain models, specific persons, or portraits of individuals. If the artist is under the age of 18, the permission statement must also be signed by his or her parent or guardian. The City of Osseo Parks and Recreation Committee will review all proposals received by the deadline, and make a recommendation to the City Council regarding final selection. The Committee and Council reserve the right to reject any and all submissions. Is the image engaging and high quality in concept? Is the image interesting and unique? Does the image work within or play with the city’s unique, historic context? Is the image meaningful to the city and its residents? Is the image consistent with the existing Downtown Osseo context? Does the image draw in the viewer and provoke positive community ideals? Does the image celebrate the city? Will a broad range of people connect with the image? The artist submitting the selected Summer or Winter banner will receive $100. Artists are encouraged to submit designs for both “Summer” and “Winter” banners. The City reserves the right to select individual banner designs and does not guarantee multiple designs will be selected from one applicant. 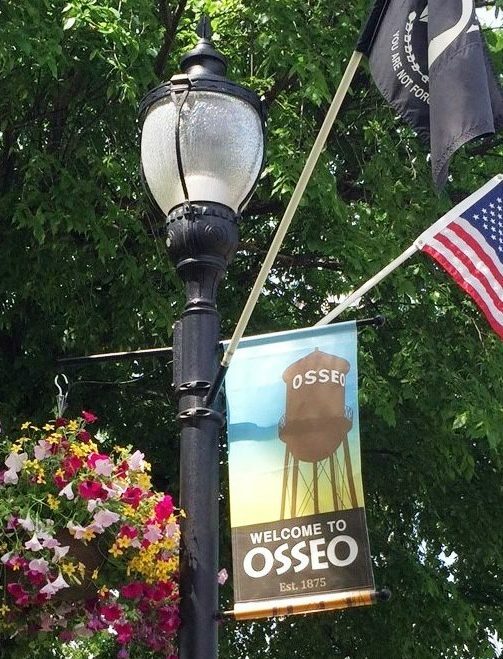 The City of Osseo logo may be used in banner designs. Fonts used in the city’s logo and other City signage include LHF Hensler 2 and ITC Giovanni Std Book. These fonts, or similar fonts, may be incorporated in designs; however, this is not a requirement. The City reserves the right to substitute fonts or logo in final designs. The City of Osseo shall possess and own the final Public Artwork design to be provided by the Artist. The Artist retains all other rights provided through the Copyright Act of 1976, 17 U.S.C. Section 101 et. seq. to the Public Artwork. Since the artistic designs leading up to and including the final design and dimension of the Public Artwork are unique, the Artist shall not make any additional, exact duplicate reproductions of the final design and dimension, nor shall the Artist grant to a third party, the right to replicate the artistic designs and dimensions of the Public Artwork without the written permission of the City of Osseo. The Artist grants to the City of Osseo and its successors or assigns, an irrevocable license to make two‐dimensional reproductions of the Public Artwork and the final designs to be used in brochures, media, publicity and catalogs or other similar, non‐commercial publications. The Public Artwork wrap and designs developed under this contract shall be the exclusive property of the City of Osseo and will be surrendered to Artist upon the completion of the Public Artwork, or upon the cancellation, termination, or expiration of this contract. If the Public Artwork prepared under this contract is work or service provided by the Artist using a proprietary system for which the Artist has proprietary rights, then the City of Osseo will not own or claim the Public Artwork as the City of Osseo’s exclusive property. The Artist represents and warrants that said work or service does not and will not infringe upon the proprietary or any intellectual property rights of any other persons or entities. DEADLINE FOR APPLICATIONS: THURSDAY, MARCH 22 26, 2018 AT 4 P.M. This entry was posted in City of Osseo News, Osseo Projects and tagged banner contest, banners, boerboom park, Downtown Osseo, Osseo Community, Osseo Minnesota, Osseo MN, public art. Bookmark the permalink.